Add to mobile or wall mounted anesthesia machine for use with models exceeding 15kg. Allows gas from the machine to circulate through absorbent material removing carbon dioxide, then returns the anesthetic gas back to the patient. There are three basic reasons for using a CO2 absorber and recirculating anesthetic gases to the patient. 1.) The total amount of gas (usually oxygen) and anesthetic agent used is reduced. 2.) The gas from the cylinder is colder than that of the patient, thus each recirculated breath helps the patient maintain body temperature. 3.) The gas from the cylinder has less moisture than that of the patient, thus each recirculated breath helps the patient avoid dehydration. Removable components for easy cleaning. 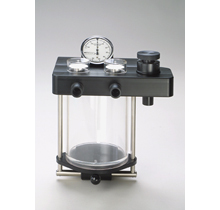 Enclosed anti-pollution valve to capture and vent waste anesthetic gases. Direct-reading manometer to monitor pressure in the breathing circuit.